"What a truly professional service - my bike was away for 48 hours and came back like new. The price was excellent and standard of service first class. I would recommend to all to use these guys"
How long will we need your bike for? This blog post will attempt to definitively answer the following questions (and their many variants). When will my bike be ready to be returned to me? When will I get my bike back? How soon will you be able to deliver my bike back? Can you guarantee when my bike will be returned? Why can't I arrange my delivery day/time when I make my booking? Why can't I arrange my delivery when you come and collect my bike? Why can't you tell me (definitely) when my bike will be be ready when you collect it? The histogram below shows this data in a more easily digestible way. Click on it for a better view. This was going be in the FAQ but given how often these questions are asked I wanted to dig a little deeper and provide a truly detailed analysis. Upto now, the standard answer was along the lines of - "80%-90% of bikes are ready to come back to the customer the day after they are collected". By analysing the considerable amount of data within our booking system, it is possible to provide a definitive answer based on the past evidence, rather than just speculate. They key figure we're looking at here is the amount of time between the collection and when the job is completed and is so ready to be returned to the customer. 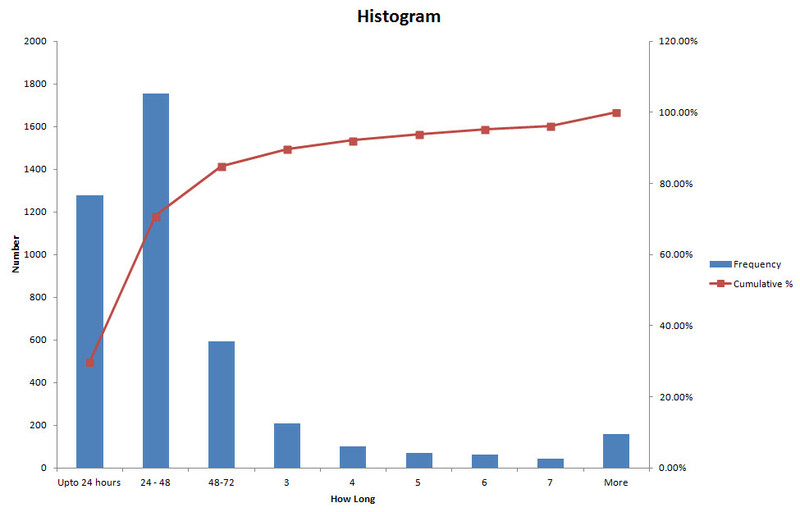 By analysing the data for every booking for the last two years we end up with the histogram and data chart. Given the most famous quote about statistics ; 'Lies, damn lies and Statistics' - I feel it's important to make a few points. These figures are derived from every completed job we have done over the last two years, therefore they will be skewed by (amongst other things) customers who for example were going away or told us there was 'no rush' and so if we were busy these jobs may have been put to the back of the queue (there is no way to exclude these jobs from the data). Now, of those 89% of jobs is there a significant change in the time taken until they are finished? Well this is pretty much as expected. 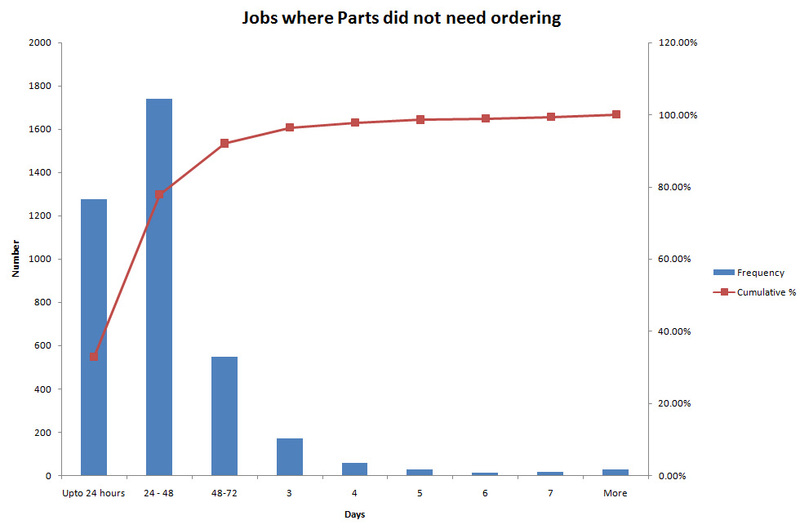 Jobs where parts do not have to be specially ordered are completed sooner. And we're nearly hitting that Magic 80% target. The 'things to bear in mind' still apply as well. The time of day your collection is. Jobs are done in the order that they are collected. Therefore an 8am collection is always more likely to be finished the same day (or next day) than a 7pm collection. The mechanic that does the job. OK this might get a bit involved but bear with me. Firstly, it is always preferable to have the same mechanic complete a job from start to finish (do I need to explain why?) Sometimes though a mechanic will need to stop working on a job before it is finished (E.g because they are driving the van or because it is the end of the day and they need to go home!) Now depending on various factors (whether the customer has told us they need their bike back in a certain time frame, whether the mechanic is working the next day etc.) they will either pass the job on to another mechanic to complete or they will pause it and leave it for themselves to complete when they are next back in at work. Naturally the time from collection to completion is longer for these jobs. Complexity of the job and other jobs that we have in the workshop at the time. I.e. If we have a lot of complex jobs in. then naturally this will result in a longer time to complete these jobs and so jobs behind them in the queue will not get started as soon - conversely if we have lot of simple jobs in - then then time to complete will be reduced and later jobs will be started sooner. Parts! No matter how wide the range of parts that we stock there will always be bikes that need parts we do not, or that we do stock but that we (or the distributor) are out of stock of. We really do everything we can to keep our parts stock to a maximum (and I think the 88.8% figure above bears this out) but there will always be bikes that are delayed due to parts requirements. Number of bikes per job. Sometimes one booking can yield 3, 4 or more bikes. If this happens with 3 or 4 bookings over a day or two (and most importantly the customers haven't informed us of the number of bikes at the time of booking) then the increased time needed to complete these jobs may impact on jobs behind them in the queue. Servicing of shocks and suspension forks. We use different specialists (mainly Mojo and TF tuned who are excellent) for these. But there is of course a delay whilst this happens. Turnaround is rarely more than a week. Time of year / the Weather. We do everything we can (within reason) to match supply with demand (see below) but no matter what we do, on lovely days in May and June everyone wants their bikes fixed. So not only do we have lots of work on but we also have lots of phone calls to answer, emails to respond to and workshop visitors to deal with. It is very hard (nigh impossible) to stop this impacting on the time taken for each bike to be completed..
Other events that are outside of our control. For example last summer we had a power cut that stopped everything in the workshop - lighting, communication, our booking system, the lot. Limit the number of bookings we take each day. Continually vary how many bookings we take per day in the future - depending on the current workshop workload. Stock over 1300 different parts and are continually expanding the range of parts that we stock. I want my bike turned round as fast as possible - what can I (as the customer) do to achieve this? Inform us when you book (not when we collect it) that ideally you really need the bike back by a certain day/time. We will add this to your booking details and do everything possible to achieve your request. Can I pay for a faster/same day turnaround? In the past it has been suggested that we could charge for a more premium, 'guaranteed' same day or next day service. Although I appreciate there may be a place for this from a service and business perspective it is something I continue to resist. Given the logistical complexities of what we do (come and observe the workshop in action on a busy spring day, if you're sceptical about that statement!) it could, I feel, make processing bikes more complex. But more so, I have (and will continue to) resist it, because I don't want us to have a two tiered service. Every bike and every customer should get the best possible service (that's what we strive for anyway). Why can't you offer a 'guaranteed' turnaround time? Why wont you arrange my delivery until the bike is finished? Quite simply, we don't say we will do something, unless we know that we definitely can. Sometimes customers are frustrated, unimpressed or worse, because we won't guarantee when their bike will be ready at the time of booking. Similarly some customers are unhappy because we will never arrange (or commit to) a delivery until the bike is finished, test ridden and has been written up. We're not being difficult or obstructive, we're just being certain not to make a commitment that we can't be certain of keeping. I think the statistics at the start of this blog post clearly illustrate that our turnaround times are very good, but, they also show that a small minority of jobs take longer. It is impossible to guarantee at the time of booking that your bike will not be one of these jobs. The same applies for arranging a delivery before a bike is finished. I am very clear to all of the staff at SCB that the use of 'absolutisms' is to be studiously avoided unless there is no doubt. Words like must, need, have, can't, will (and will not) leave no room for any other potential outcome if the original statement is to remain correct. Especially when used about events in the future that are yet to even occur! For example: "We will do our very best to have your bike ready for delivery the day after it is collected" is very different to "Your bike will definitely be ready for delivery the day after it is collected" You may think I am being pedantic, but to me this is very important. Most bikes are ready for delivery the day after they are collected.